Despite the compelling plot, Kanithan is an uninspired action thriller that has little to offer, feels S Saraswathi. T N Santhosh makes his directorial debut with Kanithan, starring Atharvaa and Catherine Tresa. Produced by S Thanu, the film is a cliché ridden thriller packed with loads of action. The protagonist Gowtham (Atharvaa) is on a mission to expose a dangerous fake educational certificate racket. Though an interesting premise, the uninspired writing and execution leave a lot to be desired. The director takes 20 minutes to introduce his characters with drab comedy. Gowtham is an investigative journalist, working for a small-time television network. His certificates are sent for a routine police verification and suddenly he is caught in a dreadful nightmare. He and a group of youngsters are arrested for forging degree certificates to get educational bank loans amounting to several crores. They are arrested and their certificates declared invalid, ending their professional careers. Gowtham uses his investigative skills to find how this ingenious network has infiltrated every field, flooding the society with a sea of unqualified, untrained individuals masquerading as doctors, engineers, teachers and civil servants. Butthe mastermind behind this network proves too clever for him. Their cat-and-mouse game adds a certain thrill to the narration, but for most part, the film is spoiled by predictable clichés. Aadukalam Naren, who plays Atharvaa’s father and Manobala, his boss, have nothing to offer. Neither does director K Bhagyaraj, who appears briefly to offer timely advice. Catherine Tresa is reduced to playing an annoying girlfriend who is nothing but trouble for Gowtham. After her more sedate roles in Madras and Kathakali, the pretty actress ups the glamour quotient here. Karunakaran has an interesting role to play, but it is the good looking and extremely fit Atharvaa, who is perfectly cast. He is this angry young man, who gives a convincing performance, excelling especially in the fight sequences that have been cleverly choreographed. Tarun Arora makes a worthy opponent, adding a challenge and lending credibility to the enormity of the crime. The background score by Drums Sivamani is too loud and dramatic, but the film is visually impressive. The racy thriller is punctuated by boring romance and mundane comedy. Director Santhosh seems determined to follow a set template with the required dose of action, romance, comedy, sentiments and songs with no thought to the flow of the narration. 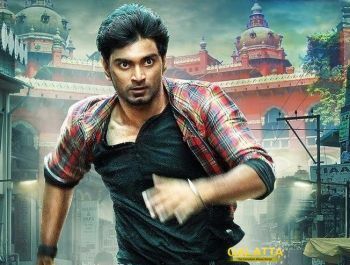 Despite the compelling plot, Kanithan is an uninspired action thriller that has little to offer.